It's easy to take for granted the beauty of our state, to assume that the humbling views we enjoy of, say, Table Rock or Folly Beach will never change. However, not only are historic sites sometimes altered or even demolished, but our natural landscapes can shift right before our eyes. Forces like fire, erosion, and even vandalism often wreak havoc with the scenes we revere. Cue the South Carolina Picture Project! The Palmetto State's favorite photo gallery holds as its mission the preservation of our state's iconic, quirky, beautiful, and beloved landmarks – both as they were and as they are – believing that place influences culture as much as culture influences place. 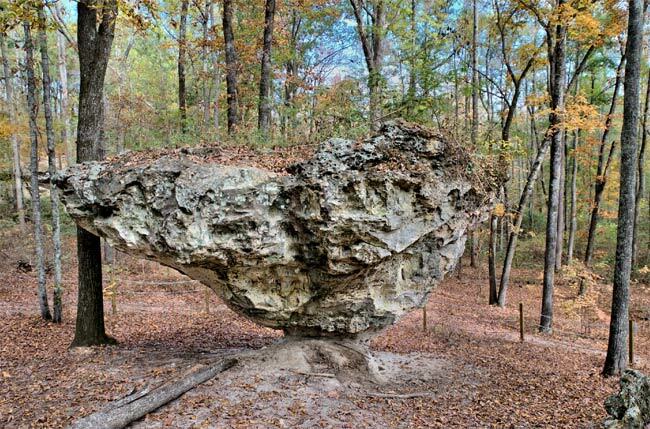 The Peachtree Rock Heritage Preserve in Lexington County recently endured a significant change, and this month we at SCIWAY would like to pay homage to its once majestic centerpiece, the namesake Peachtree Rock. 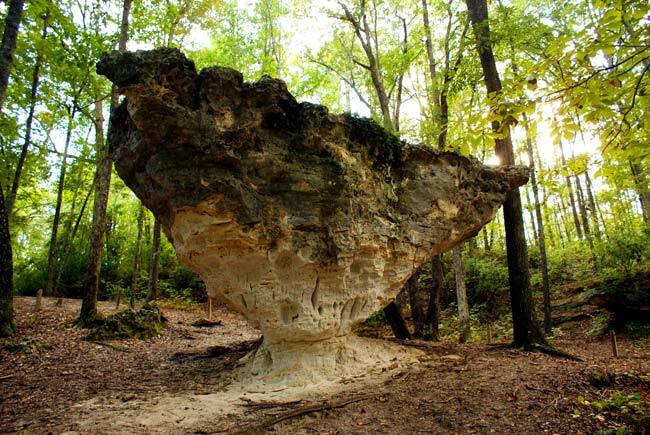 The preserve is known for both its incredible variety of vegetation and its sandstone rock formations. Narrow at the bottom and wide at the top, the structures assume the shape of peach trees, a crop so integral to South Carolina's culture as to literally influence the way we see things. 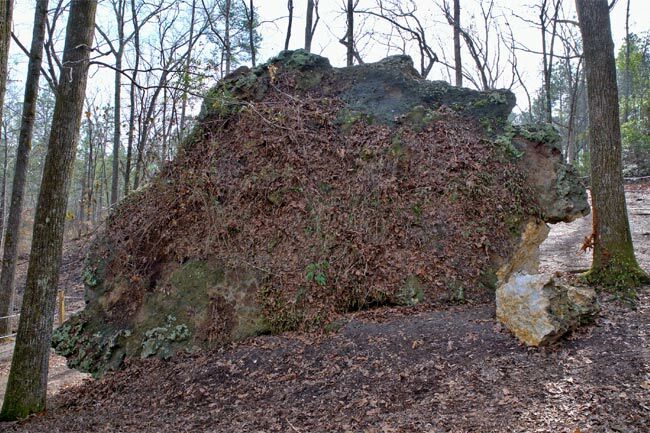 The most famous of these structures, the Peachtree Rock, stood alone in a valley – likely for millions of years – until it toppled on December 8, 2013. Roped off from visitors, Peachtree Rock has suffered vandalism through the years, ranging from seemingly innocuous acts as people carving their names into the stone to more nefarious ones such as others sawing into its base. 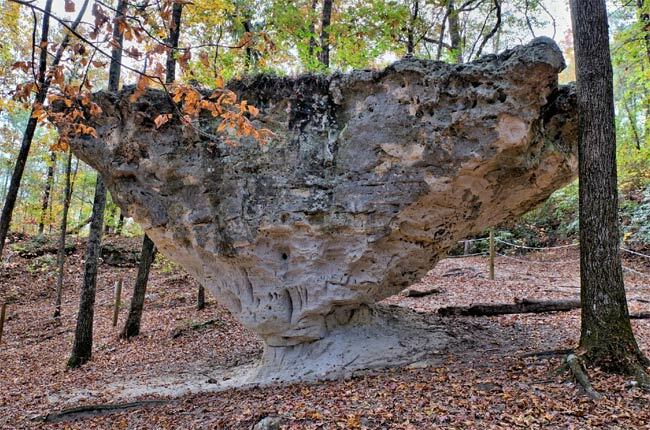 While the cause of the rock's toppling is undetermined, managers of the preserve believe that the intentional damage done to the rock contributed to its fall. Mark Robertson, director of the South Carolina Chapter of the Nature Conservancy, says, "There's no doubt [it] was accelerated by vandalism." Many suspect the large formation was pushed. The good news is, many similar "peachtree rocks" stand throughout the preserve, though often connected instead of free-standing. The unusual rocks are the result of erosion from pre-ancient times when the ocean swept the banks of the Midlands. The bases of the formations are made of sandstone, as soft and malleable as it name implies, easily yielding to pressure. Ironstone comprises the tops of the rocks, which are considerably heavier than their sandstone bottoms. While the formations stand precariously throughout the preserve, no one expected Peachtree Rock – the most prominent of the boulders – to succumb just yet. As interesting as these formations are, the Peachtree Rock Heritage Preserve is actually most renowned for the diversity of its plant communities. 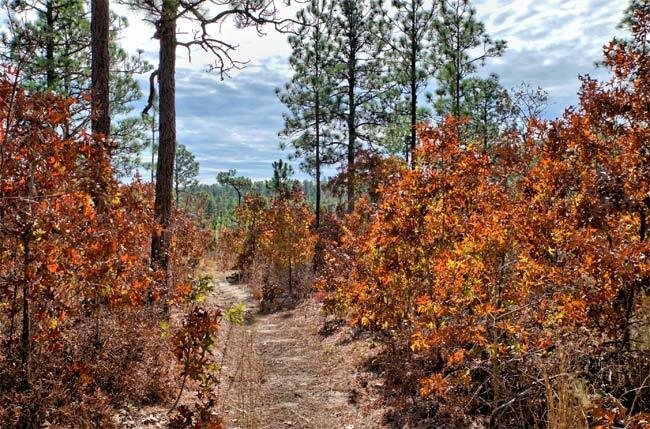 Near Swansea, the 460-acre natural arboretum draws plant enthusiasts from far and wide and features habitats ranging from a mountainous stream to a long leaf pine ridge coated in white sand. 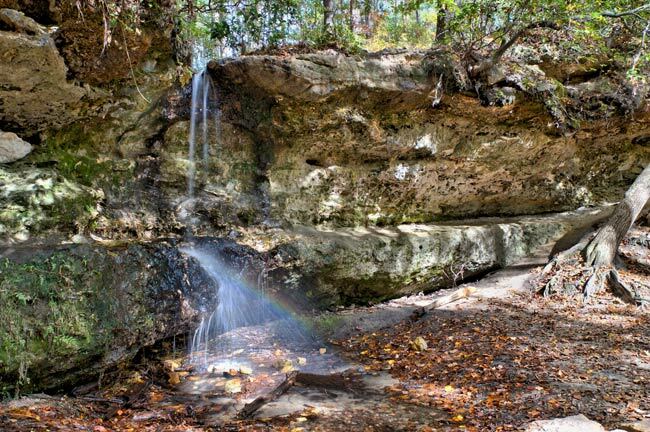 The preserve is also home to the Midlands' only naturally-occurring waterfall, a 20-foot cascade which creates Hunt Creek. 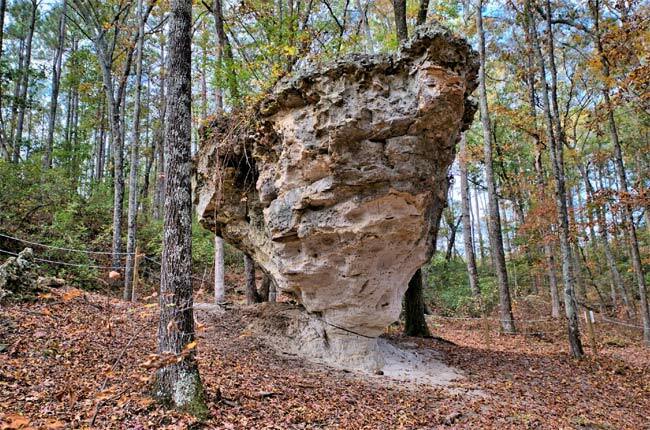 The pristine acreage is managed jointly by The Nature Conservancy and the South Carolina Department of Natural Resources, and unless someone comes forward with information, neither organization expects ever to know for certain the cause of the rock's fall. The Peachtree Rock remains in the spot it has occupied for countless millennia, no longer standing but serving as a reminder that nothing is immutable as our state continues to change and evolve. Thankfully, contributors to the South Carolina Picture Project can help preserve places such as the Peachtree Rock Heritage Preserve as we love to remember them. You may notice that many of the photographs on this page were taken by the same person, Larry Gleason. In fact, Larry has contributed nearly 100 photos to the South Carolina Picture Project, helping make our collection of Palmetto State landmarks as extensive and exquisite as it is. After serving in the military, Larry made Aiken his home in 1978 and has been enjoying digital photography since his retirement in 2002. He refers to himself as a "utility photographer" because he never knows where or what he will be asked to photograph. Despite being a newcomer to the industry, Larry has managed to stay busy shooting several types of events for various organizations, accepting assignments for magazines and other publications, and supporting a commercial aerial photography business. We at SCIWAY are happy to consider Larry a friend. 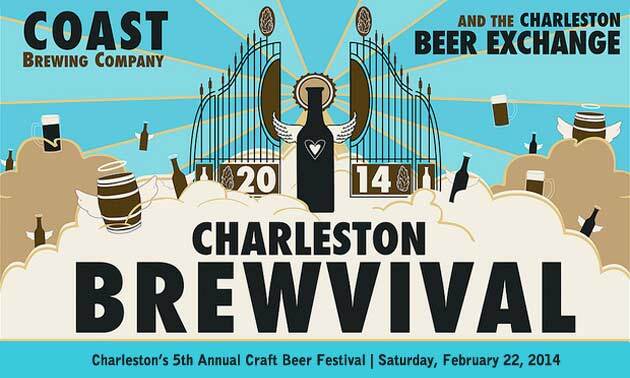 Saturday, February 22, 2014 | North Charleston — This year's February Calendar of SC Events is brought to you by the Charleston Brewvivial, where the highest quality and most unique beers from the best breweries in the country (and world) will be available for your sampling pleasure at an all-day celebration. From 12-5 PM, you'll be able to meet brewery owners and taste some of their best creations including many extremely rare offerings hardly ever seen elsewhere. To keep things rocking, there will also be great live music throughout the day! In addition to SCIWAY's February Calendar of SC Events, remember that all of our event calendars, for every month of the year, are always available on our website – just go to https://www.sciway.net/calendar.html. You can sort events by date, city, name, or type – it is hands down the best South Carolina calendar anywhere!